What Summer Shows Did TNT Renew? If anyone out there is a big fan of The Last Ship, Major Crimes or Falling Skies, I have some great news for you, if you haven't already heard. TNT renewed these hit summer series for more seasons of fun for the summer television viewer! Though for the Falling Skies fan, the next season will be its last. TNT has renewed three of its chart-topping summer hits: The Last Ship, Major Crimes and Falling Skies. All three dramas rank among basic cable's Top 5 scripted series this summer with total viewers and adults 25-54. They have also helped TNT score a significant lead as basic cable's #1 network in primetime for the summer-to-date. TNT has ordered 13 episodes of The Last Ship, an increase over its first-season order of 10 episodes. The network is also ordering 15 episodes for season four of Major Crimes. And Falling Skies will mark its fifth and final season with 10 episodes. "TNT's refreshed and recharged drama brand is soaring this summer, and that is due in large part to these three enormously popular dramas," said Michael Wright, president, head of programming for TNT, TBS and Turner Classic Movies (TCM). "The Last Ship has become this summer's top drama among key adult demos with its epic scale and visceral storytelling. Major Crimes continues to be one of the most enduring and popular crime-drama franchises on television. And Falling Skies has begun an ambitious and thrilling story arc this summer as it sets the stage for next year's climactic final season." The Last Ship is a blockbuster hit in its first season, not only among total viewers but also among key adult demos. 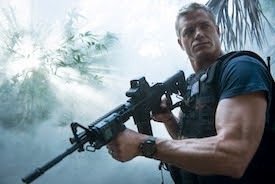 The action-packed drama from executive producer Michael Bay has averaged more than 7.2 million viewers in Live + 7 delivery in its first season and currently ranks as basic cable's #1 scripted series this summer with adults 18-49 and adults 25-54. The show is also cable's #1 new series for the year-to-date among total viewers and adults 25-54. Major Crimes is showing an uptick over last year, with 7 million viewers in Live + 7 delivery for its third season so far. It ranks second behind Rizzoli & Isles among the summer's top scripted series on basic cable. Major Crimes has also drawn key demo deliveries of 2.1 million adults 25-54 and 1.5 million adults 18-49. Falling Skies has averaged more than 5.5 million viewers in Live + 7 delivery for its fourth season, including 2.5 million adults 25-54 and 2.1 million adults 18-49. It ranks behind The Last Ship and Rizzoli & Isles among basic cable's Top 3 scripted series this summer with adults 25-54. TNT's summer success also includes Rizzoli & Isles, which ranks as basic cable's #1 scripted series this summer. The show has brought in a whopping 8.5 million viewers in Live + 7 delivery in its fifth season, a slight increase over its summer average last year, and ranks right behind The Last Ship as basic cable's #2 scripted series this summer with key demos. In addition, TNT's new crime-drama Murder in the First has averaged 5.0 million viewers in Live + 7 delivery for its first season, and Perception is averaging 4.6 million viewers in Live + 7 delivery for its third season. TNT will continue to roll out summer dramas in August. The network will launch the highly buzzed-about drama Legends, starring Sean Bean, on Wednesday, Aug. 13, at 9 p.m. (ET/PT). It will be followed by Franklin & Bash, which is coming back for its fourth season. And on Aug. 18, Dallas will return to continue its third season.